I have been enjoying all the riches of summer, the long days and verdant hues, the warm nights and pink skies that unfold at the end of the day. The grass stains on my sons knees and their dirty feet are all signs of a perfect day spent running through sprinklers, hiding out in their teepee, sneaking green beans from the garden and the giggles that fill the air while they're eating watermelon on the back deck. I'm trying to savor every single moment of it, all the while the laundry piles up and dust bunnies hide in the corners of our house. Summer is a perfect season to turn a blind eye to chores and soak in every spare minute of light, warmth and time spent with friends and loved ones. I always feel like summer knows just how to nurture us. Giving us more hours in a day to make the most of and gifting us week after week some new jewel that has just ripened and is at its peak. The fun anticipation of ones favorite berry or tomato may just be around the corner, talking with the farmers at the market, they give a forecast for the following weeks and a reminder of what will be no more until next spring and summer. An interesting way to look at the passing of time through the bounty of summer. I always look forward to apricots. They could possibly be one of my favorite fruits. I'm amazed at how many I've been able to buy at the market, it's been a good season. 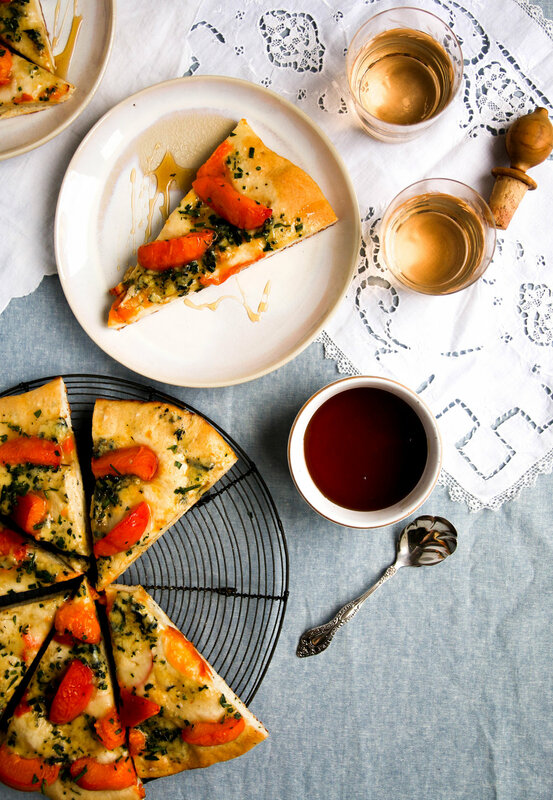 This apricot focaccia was a great way to put to use the abundance of fruit I came home with. Perfect with just a salad and a glass of your favorite wine or a starter to a fun filled night with the best company possible. Fresh tarragon and blue cheese work great with the sweet/tartness of the fruit, I added a drizzle of the most beautiful honey that was gifted to me from my dad. As with most recipes, you can sub in your favorite stone fruit or grapes (of which I adapted this recipe from). Would love to hear any of your adaptations or additions! In a large bowl, whisk yeast and sugar with 1/4 cup of the flour. Stir in 1/4 cup of the warm water, and let stand until slightly foamy, about 5-10 minutes. Add tarragon, kosher salt, pepper and the remaining 1 3/4 cups of flour and 1/2 cup water. Turn dough out onto lightly floured surface and knead dough until smooth, this can take up to 10 minutes. Transfer dough to an oiled bowl, cover and let rise in a draft-free spot until billowy and doubled in size, about 1 hour. Preheat oven to 450 degrees. You have a few options of how you want to cook the dough; place a pizza stone in the bottom of oven to preheat for at least 30 minutes, I prefer to use a cast iron skillet ( 14 inches ), oiled with a little bit of olive oil and preheat in the same fashion. Turn dough out onto lightly floured surface. Press and stretch the dough into a 13 inch round, then transfer to the pan/stone you are cooking with. Press apricots into dough and sprinkle with sea salt. Bake for 12 minutes, until crust is golden and the apricots have begun to release some of their juices. Sprinkle blue cheese on top and bake for 2 minutes longer. Slide the focaccia onto a work surface and drizzle with honey and sprinkle with chives. Cut into wedges and serve.